Delish. This is a favorite from my favorite Food Network chef, Anne Burrell. Perfect for a Super Bowl Party or cocktail party. Brown the pancetta over medium-high heat in a medium non-stick sauté pan. Add the onion and the crushed red pepper, and season with salt, to taste. Cook until the onions are very soft, 3 to4 minutes. Add the garlic and cook for another minute. Stir in the mushroom stems and rosemary and saute until they brown and softened. Add the white wine and cook until the wine has evaporated. Remove from the heat and let cool. In a large bowl combine the pork, egg, Parmesan, and bread crumbs. Add the cooled mushroom mixture and combine well. Make a little tester patty and cook it to make sure the seasoning is correct. Season with salt, if needed. 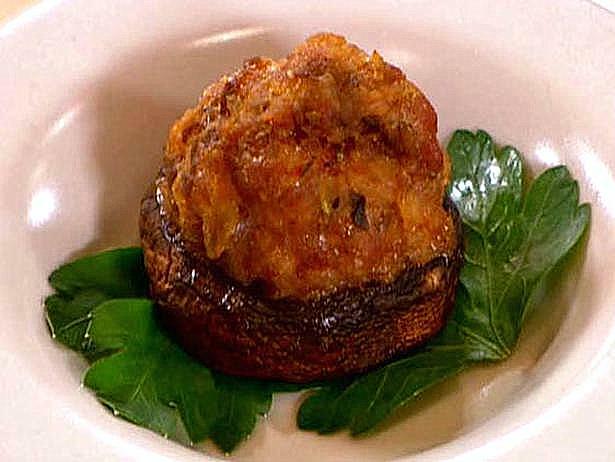 Fill each mushroom cap generously with the filling. Arrange on a baking sheet and bake until the filling is cooked through and brown and crisp on top, about 7 to 8 minutes. Transfer to serving platters and serve hot. This entry was posted in Appetizers & Party Food, Bariatric Recipes, Beef, Lamb & Pork, Main Dishes and tagged & Lamb, & Nibbles - sugar free, A Superbowl Party, Appetizers & Party Food, Beef, Cocktails, Pork, Shirley Temples, woo woo.